Media-N, Journal of the New Media Caucus (http://median.newmediacaucus.org/) is pleased to announce an open call for guest editors for its Spring 2016 and Fall 2016 issues. New media artists and scholars are invited to propose themed special issues of Media-N, which they would edit under the auspices of the Editor-in-Chief, Pat Badani, and a designated associate editor. The deadline for submissions is May 15, 2015. Media-N’s editorial board will review the submissions and notify selected guest editors in June. We offer opportunities for qualified scholars and/or artists to plan and edit themed issues that address topics of current interest to Media-N’s readership. We encourage those interested in submitting proposals to visit our archives (http://median.newmediacaucus.org/archives/) to become familiar with previous themed special issues such as Art & Infrastructures: Hardware (8.2) or Tracing New/Media/Feminisms (9.1). Each special edition editor, working under the guidance of the Editor-in-Chief and an assigned associate editor from Media-N’s board, would be responsible for drafting a CFP for the special issue, assisting in the peer-review process, inviting contributions from noteworthy artists and scholars, coordinating with selected and invited contributors, and copyediting and proofreading the edition. -Send your proposal to Editor-in-Chief Pat Badani: mailto:medianjournal.badani@gmail.com. -Attach a three-page CV as a separate Word document. Note: Media-N adheres to the publication guidelines set out by the Chicago Manual of Style, 16th Edition. Articles will not be published if guidelines are not met. Media-N, Journal of the new Media Caucus (ISSN: 1942-017X) is a scholarly, invitational, and blind peer-reviewed journal, open to submissions in the form of theoretical papers, reports, and reviews on new media artworks. The journal provides a forum for national and international New Media Caucus members and non-members featuring their scholarly research, artworks and projects. The mission of the electronic and print journals is to promote academic inquiry; to reflect the wide variety of themes and areas in new media research; to further the evolving discourses related to theory and practice; to showcase the work of new media artists and their presentation environments; and to investigate the issues surrounding education and new media. The journal has published articles by influential new media theorists and practitioners such as: Mark Amerika, Sarah Cook, Amy Franceschini, Lynn Hershman Leeson, Jennifer and Kevin McCoy, Ken Rinaldo, Laurence A. Rickels, Cornelia Sollfrank, and Faith Wilding. Three editions are published per year: spring, summer and fall. Media-N’s online and print versions differ in format but are similar in content. The publication is freely available online, and the print version may be purchased through a print-on-demand service. Each has a unique ISSN. This email was sent by the New Media Caucus, College Art Association Affiliate Society. Let people know what you’re doing. 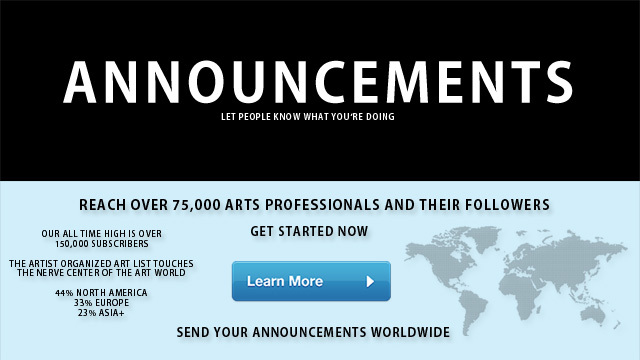 Our low cost announcements reach over 75,000 arts professionals and their followers. Get started sending announcements about exhibitions, book launches, crowdfunding campaigns, concerts, broadcasts and more. Our all time high is over 150,000 subscribers. Our qualified list touches the nerve center of the international art world. 44% North America, 33% Europe, 23% Asia+ and beyond. We can help turn your next release into a global fact at a fraction of the cost. We are a 501(c)(3) non-profit supporting artist organized media, events and cultural education. When you sponsor an announcement with us you support artists working in communities everywhere in the world. Learn More.